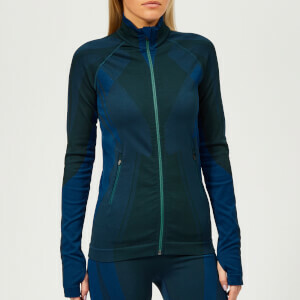 Cut for a tight, streamlined fit and knitted on a circular loom for a smooth, seamless finish and superior flexibility, the women’s ‘Spright’ jacket from British active-wear label, LNDR, features a stand-up collar and full-length zip closure at the front. The sweat-wicking, antibacterial jacket is designed with a raglan construction, the long-sleeve jacket features contrasting panels of differing deniers that create pockets of ventilation. Thumb-holes keep sleeves extended and side zip pockets offer secure and easily accessible storage for essentials.